The most important part of a coaxial cable is the center. If it’s solid copper, it can carry the signal from your antenna or dish, and it can also carry power to the antenna or dish. If it’s just copper-coated steel, it’s still perfectly good for carrying signal. The outer parts of a cable can get nicked and it might still work well, but the inner part, that inner wire, that’s something special. That has to be protected. In addition to metal braid on the outside, and a rubber weatherproof barrier over that, the center conductor is surrounded by what’s called a “dielectric.” It insulates the cable from all interference as well as keeping the signal going down the cable without leaking out. Cheaper dielectrics are solid plastic while more expensive ones can be made out of foam for even better performance. If all it does is insulate, why call it a dielectric? Why not call it an insulator? A dielectric is an insulator, but it’s a special one. A dielectric actually reacts to the signal traveling on the center cable by becoming polarized. (Polarized is just a fancy way to say that all the molecules start pointing the same way.) So it’s not just passively insulating like a piece of rubber would, it’s actually insulating better as more and more signal goes into it. A magnetic field is created that does a better job of insulating than tons of rubber ever could. It’s easy to see, then, why the dielectric is actually one of the most important parts of your average coaxial cable. Coaxial cables are really good at carrying weak signals over long distances — they’re used for undersea long distance lines. The do such a good job because the dielectric does such a good job of keeping bad signals out and keeping the good ones in. The type of dielectric used is part of what determines the impedance of the cable. The diameter of the center conductor, the “constant” of the dielectric used and the distance to the outer layer [which acts as a ground] is what defines the impedance. Most common coax dielectrics have a constant of about 2.2, so the physical dimensions of the cable is compatible with RG59, RG6, RG11, etc. Teflon is 2.1, Polyethylene is 2.25, “Foam” would need to be a mix of Polyvinyl chloride [3.18] and Air [1.0]. 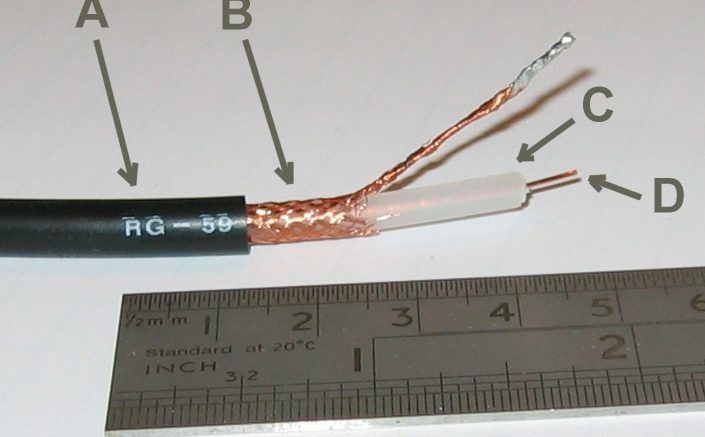 Neoprene [6.70] could be used, but the outer layer would need to be much closer to the center conductor and the coax would be smaller, requiring special connectors to mate with F-type connectors. So, take a minute and give some respect to that white foamy stuff… without it you probably couldn’t watch satellite TV. Cables: How short is too short? What should you do with old RG6 cable?